Prime Minister Justin Trudeau, right, and Minister of Foreign Affairs Chrystia Freeland met with auto parts executives on Feb. 27 in Toronto. 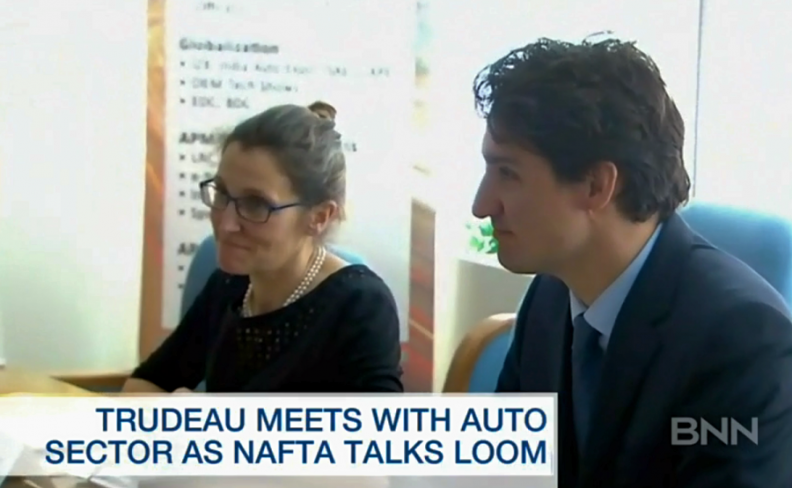 While the head of Canada’s Automotive Parts Manufacturers Association was impressed with Prime Minister Justin Trudeau’s willingness to discuss the industry this week, he is equally impressed by Chrystia Freeland, the country’s minister of foreign affairs. Volpe praised Freeland during an appearance Feb. 27 on Business News Network with host Greg Bonnell. Despite no longer being Canada’s minister of international trade, Freeland will be Canada’s point person on NAFTA renegotiations with the United States and Mexico. You can watch Volpe discuss Freeland, NAFTA and more in the video below.